Delights-Gems: Let's Make Stitch Markers!!! This blog focuses on and links with my ravelry.com projects. The purpose is to share patterns and projects with kindred knitters, crocheters and handcrafters. As soon as I picked up a pencil and crayons, I began to draw and create. As an adult, my skills punctuated every job: displays when I served as a retail store manager; diagrams and graphics in a high tech firm; and graphics and logos as a small business print consultant. Now that I am a retired senior citizen, I am returning to the fun and freedom of creating like I did when I was a child. Introduction: Who doesn’t like pretty things and a little bling from time to time? How about a little knitting or crochet "jewelry" while creating your projects? Well, that’s what I was thinking when I asked cindylen* to join me in hosting an event on making stitch markers in the From Trash to Treasures group on ravelry. Here’s our opening graphic that we used to invite members and welcome them to our little June event, though this appears much smaller here than it was in our thread. *cindylen is Cindy’s ravelry name. In ravelry, we protect our identities through self-selected names and avatars as we participate in groups and events. Our purposes were to learn (or hone) stitch marker skills to make sets for giving, sharing or selling; and to share a little fun event which would culminate in a post on my blog. The event has completed so it's time to post our accomplishments. The Categories: cindylen and I put our heads together and came up with a few suggested categories for making stitch markers. Since this is a group that states it is focused on "recycling, upcycling, reusing and repurposing," we decided to include a category or two with these attributes in mind. 1. Made from scratch stitch markers: creating beads or embellishments from clay, wood, paper, yarn or ? 2. 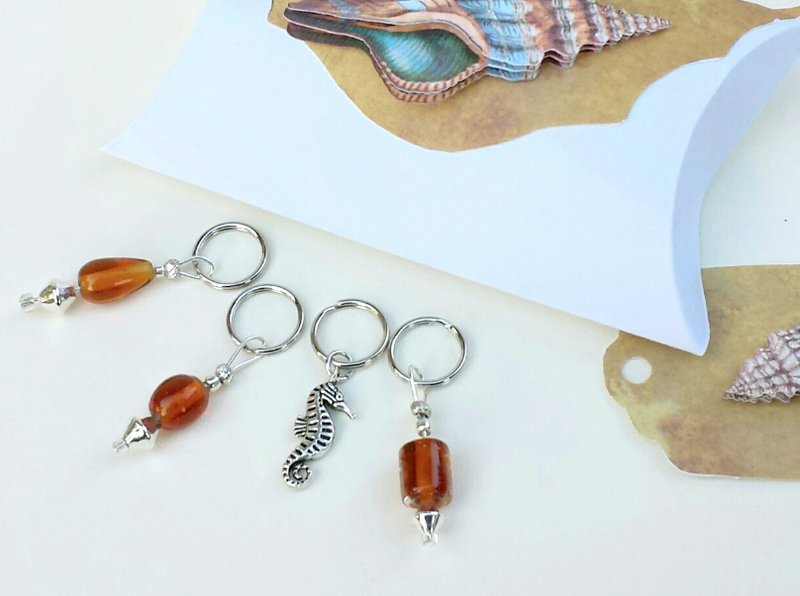 Nature stitch markers: things found in the woods, at the beach, in your own backyard or ? 3. Repurposed stitch markers: made from things that started life as something else but used for this purpose. 4. 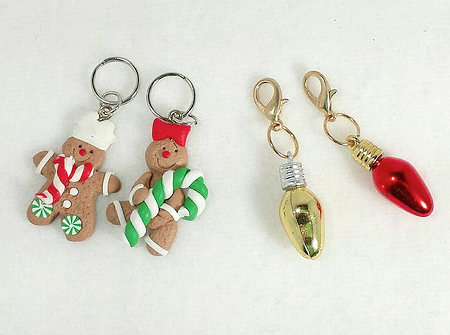 Themed or holiday stitch markers: a central theme (food, animals, flowers, Christmas, etc.). 5. Wire Wonders: shapes made from wire. 6. Presentation sets: complete sets of markers with gift giving in mind. 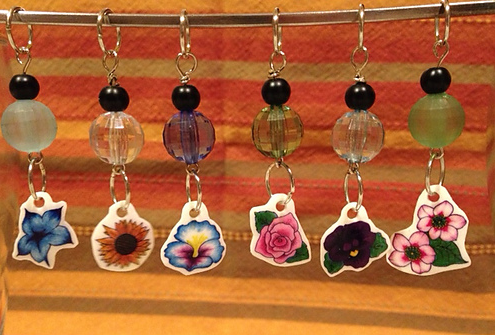 This set of knitting stitch markers, made from Shrinky Dinks, is a flower lover's treasure featuring such flowers as a rose, sunflower, daisy and daffodil. 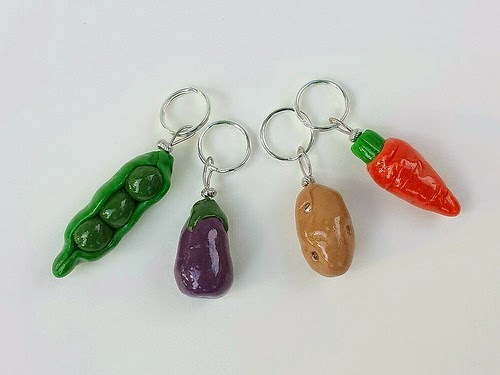 Hand-formed from Fimo clay and baked to hardness, this set of knitting stitch markers includes peas, an eggplant, a potato (complete with eyes) and a colorful carrot. This second set of six flower knitting stitch markers by cindylen and also made from Shrinky Dinks, includes beads to help weight the markers. How unique is this? 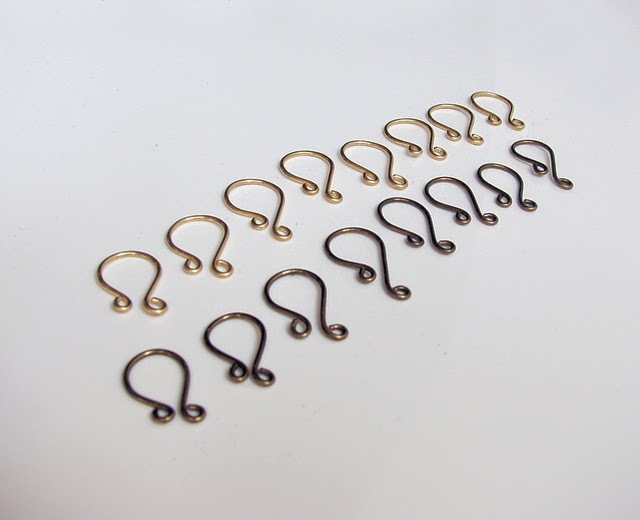 This set of knitting stitch markers is from daytripper's husband's tackle box (with his permission, of course). 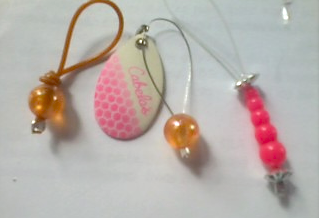 daytripper used all sorts of fishing goodies including fishing line, beads that look like salmon eggs and a pink Colorado blade lure. Another unique set of stitch markers: center beads made from rolled strips of denim from an old pair of jeans. cindylen rolled and glued and rolled and glued to concoct this set. Notice that one bead is different from the other four. The purpose of a unique marker is to mark the beginning of a round or the start of a stitch sequence. This set could fit comfortably in either the Repurposed or Made from Scratch category. cindylen rolled these cylindrical beads from a page from a JoAnn Fabric and Craft Store circular. These are attractive AND functional. Floriental specialized mostly in crochet stitch makers bending wire in unique ways to produce her sets. For crochet projects, the markers attach to stitches themselves, rather than slide on a needle, as in knitting. This set of Rainbow Beads includes graded colors in one hue per bead—eight in all. 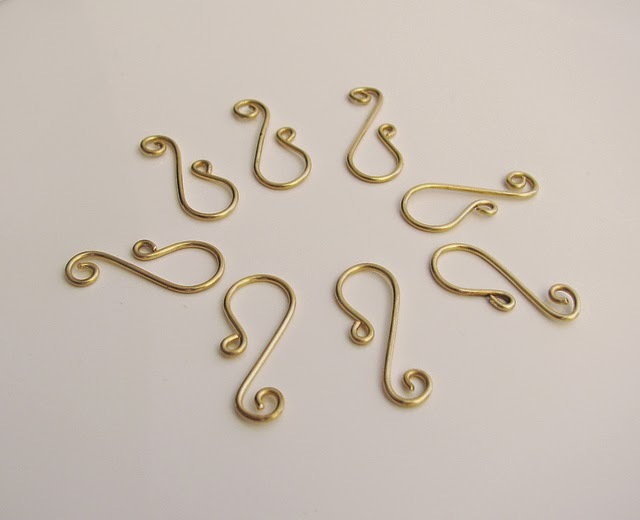 Here's a set of eight crochet stitch markers made from a gold colored wire that Floriental bent to shape. This set is a more understated set. Eight seems to be the magic number for Floriental's sets of markers. 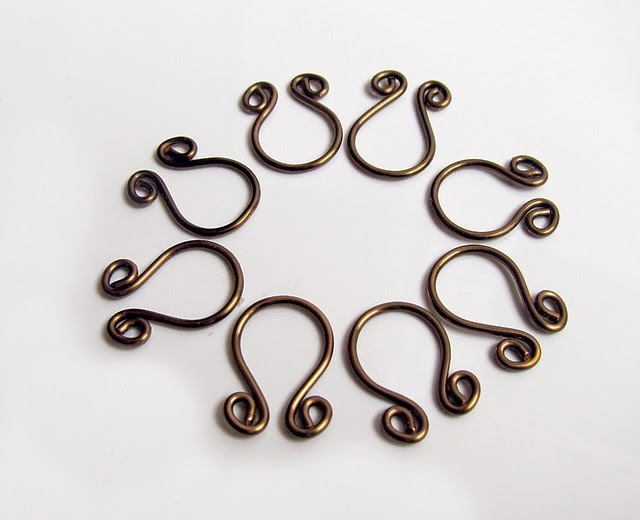 Here's another set of burnished gold in a U shop or horseshoe shape for the crocheter. 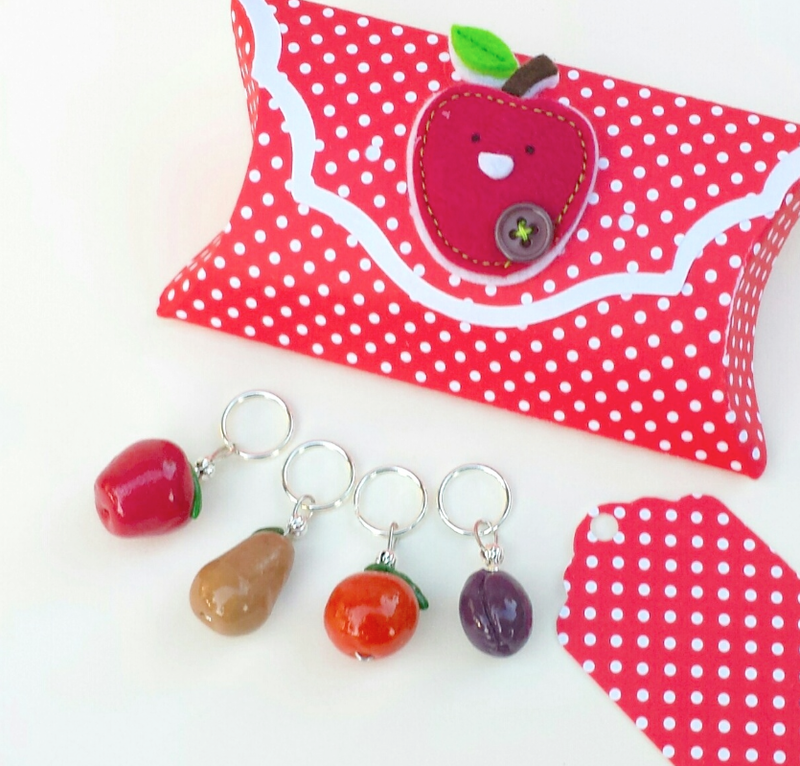 Floriental was on a roll making stitch markers! Here are two more sets in two different metal tones. In this event cindylen was the most adventuresome, trying more categories and adapting more materials. 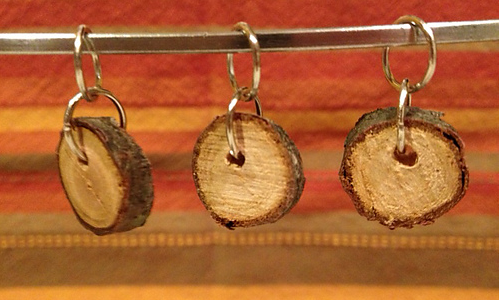 Here is her set of knitting stitch markers wood discs. delights made over two dozen sets of stitch markers during this event, most of which were themed. This one features a seahorse as the one unique marker in this set of four. She coupled it with a handcrafted box and tag for a complete themed set. 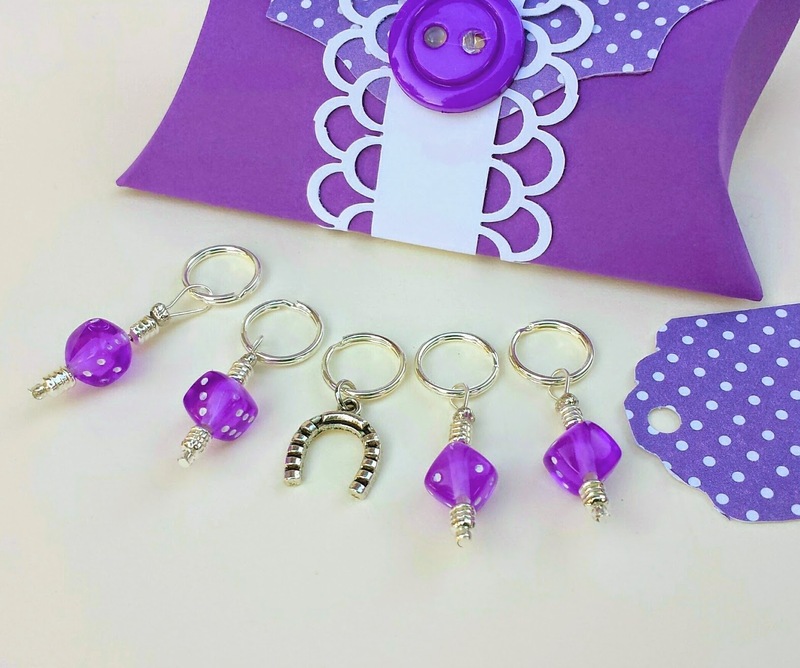 Here's a themed set of five knitting stitch markers featuring purple dice beads with one unique marker of a lucky horseshoe charm. Actually, these are two distinctly different sets: the two gingerbread cookies are knitting stitch markers and the two Christmas bulbs are crochet markers. About the crochet markers: notice the clasp at the top. This type of clasp is called the lobster claw. 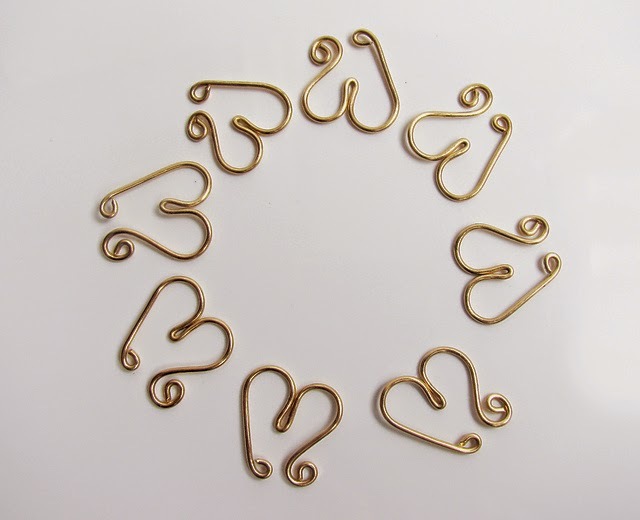 It's a jewelry making supply but works perfectly for crochet stitch markers. This set could also fit in the repurposed category as the gingerbreads were earrings and the bulbs were plastic Christmas decor. This is a set of Fimo clay markers, which could also fit in the Made from Scratch or Theme category but here it is shown as a presentation set—a complete gift set. delights is making sets of markers for two of her Etsy shops. Here is (from L-R) an apple, a pear, an orange and a plum. 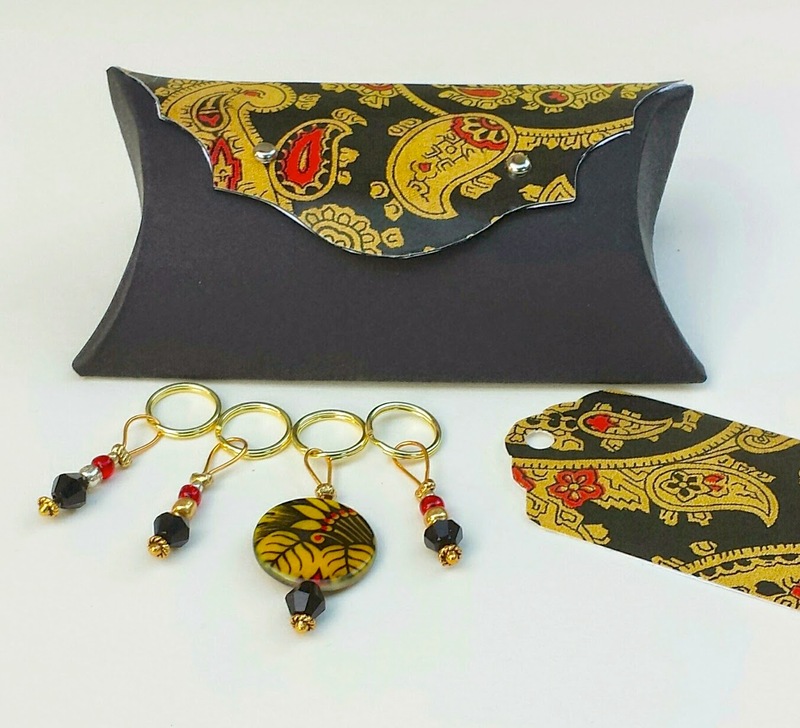 Here's a striking set of four knitting stitch markers in black, gold and red with one unique stitch marker. Very beautiful and creative. What a wide use of materials. I'm just not that creative in using stitch markers. I've been gifted some beautiful ones, which I usually pass on to those I know will use them. I'm pretty boring and practical when it comes to mine. Oh what a fun project. 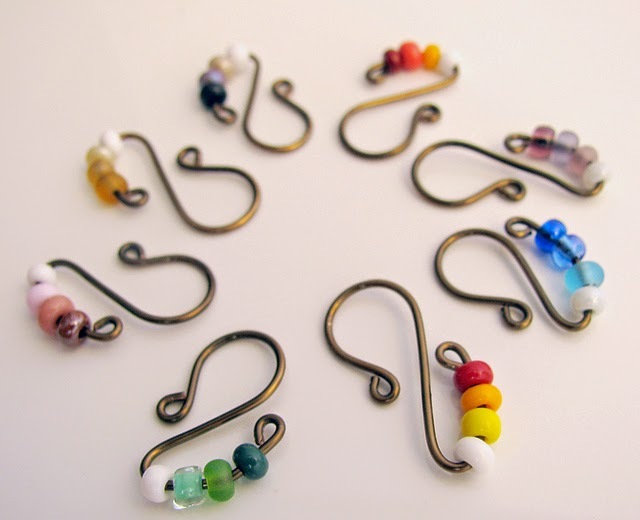 So many creative approaches to creating crochet and knit stitch markers. Great showcase.